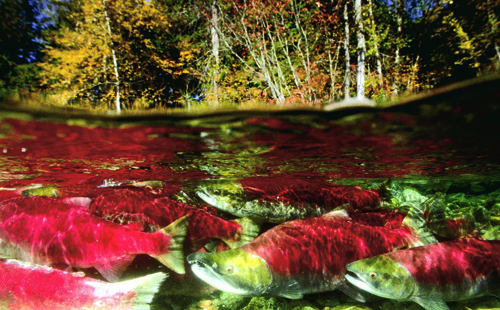 The migration of the salmon is one of nature’s most dramatic and exciting journeys. We still do not know how they find the river where they were born to return to spawn. People from Alaska to southern California depend upon the annual salmon migration as an important food source. Salmon fishing provides tens of thousands of jobs in the sport and commercial fishing industries and hundreds of millions of dollars in economic benefit to the West Coast. Because salmon need pure, cold water, they are extremely vulnerable to water pollution and diversion. Twenty-seven West Coast salmon runs are endangered. Salmon and steelhead are an important part of the food chains of at least 150 other species, including humans. As the healthy stream habitat for these species has been destroyed by human development or been blocked by dams, tens of thousands of fishing-dependent jobs have been lost, and subsistence fishing-dependent Native American communities have been threatened. Restoring these stocks not only makes good biological sense, but it would provide billions of dollars in economic benefits to these struggling coastal communities. Each of these salmonid species is “anadromous,” which means they lay their eggs in freshwater, their young (then called “smolts”) gradually move downstream as they grow over several weeks to months where they adapt to salt water conditions in an estuary, and then they spend between 2-5 years in the oceans before returning upstream to lay their eggs in precisely the same river reach as they were hatched in. These fish can migrate many thousands of miles, against many obstacles, as they grow in the ocean to maturity and then migrate back to their natal streams to lay eggs and die. Each species has developed genetically and behaviorally distinct sub-species comprising different “runs,” each evolved for the specific freshwater conditions in their natal streams, with different runs often returning at staggered times each year to take advantage of multiple habitat niches. In 1992, the American Fisheries Society (AFS) identified 106 distinct Northwest salmonid runs as extinct, with another 214 runs in Northern California and the Pacific Northwest at varying degrees of risk of extinction in the near future. Salmonids are cold water fish which typically die when exposed for very long to freshwater temperatures above about 20º C. (72º F.) Global warming has pushed the average summer temperatures of many west coast river systems above that mortality threshold, killing many fish. Global climate change is also diminishing total river flows throughout the northwest and California, as well as changing the basic hydrology that these fish evolved with. In many areas their already limited range is likely to contract. Depleted genetic diversity as well as accelerated habitat loss due to human development has reduced their ability to respond to these stresses. Changing ocean conditions, including ocean acidification, are causing additional stresses to these populations from global warming.